Our LATH Digital Team will be meeting to explore some awesome ideas and move further along with our digital experience. Our team consists primarily of our different social media groups that help update the group about upcoming events, hiking news, and all other updates. OPEN SESSION: Although this is geared toward active team members, we will open this session to invite new volunteers who may want to help on the digital front. We have some awesome volunteers who help the group in different areas. But, this time, we’re looking to include new people that haven’t had a chance to participate in group in any capacity. are also hiking enthusiasts who are social media account savvy, familiar with website content maintenance (comfortable with HTML/Wordpress), or will be able to help supporting the LA Trail Hikers should come by and see how you can join our group. Follower feedback, what are they saying/requesting/praising? Bring your mobile devices, but keep in mind that there’s no Wifi available at the meeting location. Also, plan to arrive a few minutes earlier to have time to park and wait to order/purchase some food if you are looking to enjoy some food. Winter keeps hikers cool and trails crisp. Happy 2018! Cooler weather and beautiful fall colors make group hiking fun! HIKES LIST NOTE: Hikes are linked only after they’ve been updated with the correct information. Thu – Nov 23 – Happy Thanksgiving LATH! San Gabriel Valley Trail Walkers will do their annual Thanksgiving Day Hike! Fri – Nov 24 – #optoutside – Take your family and/or your friends out to enjoy some nature! Pasadena Hiking Pacers, will be hiking to Monrovia Canyon Falls! 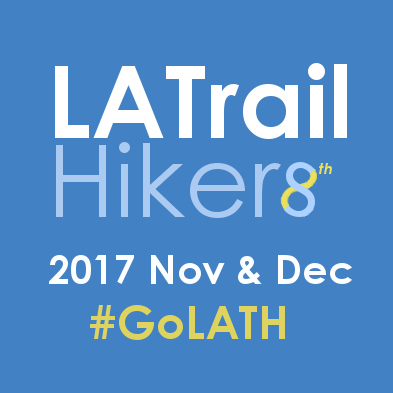 Every year the LA Trail Hikers take a LATH Winter Break to allow the LATH Hike Leads and LATH Digital Team to enjoy the holidays with friends and family (to join them or to host them locally). Our last hike of the 2017 hiking season will be on December 20, and we’ll return to the trails as a group in January of 2018. 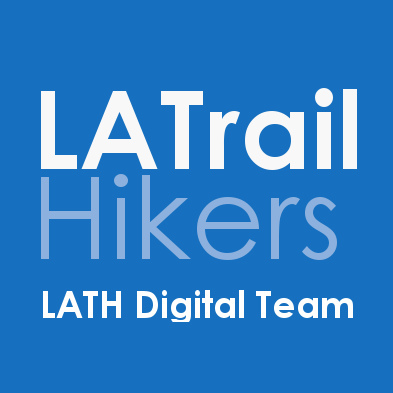 The LATH Digital Team keeps you updated on upcoming LATH hikes/events, provide outdoor news/updates, share fun pictures, and help answer your hiking or LATH questions. So make sure you connect with us online! 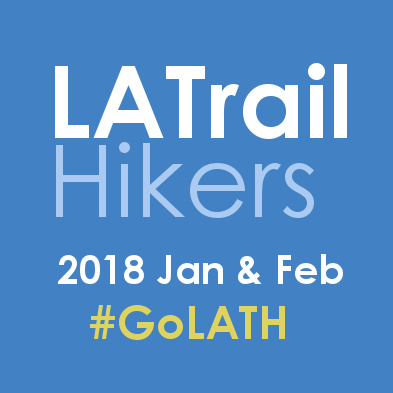 If you take pictures on our hikes, don’t forget to tag your LATH hike posts, photos, and updates with #LATH #LATrailHikers #WeHikeLA and/or #GoLATH to show others what it’s like to be out with our group! On Tuesday, October 03, 2017, from 7:00pm to 8:30pm, we’ll be hosting our LATH Hiking Tips, Tricks, & Stories event at Holy Grounds Coffee & Tea. The best part about this event is that it’s going to be brought to life by you! We’re looking to have our very own hikers take the stage, for a few of minutes, to talk about their great hiking experience tips, tricks, and stories! A few examples topics: why wear hiking socks, footwear recommendations, hiking poles, gaiter use, why crampons/micro-spikes, getting an Adventure Pass, cleaning your hydration pack, importance of electrolytes, types of snacks to carry, tying your shoes for special cases, hiking etiquette, physical/mental health success stories, why you enjoy hiking with the LA Trail Hikers, what hiking means to you, importance of leave no trace, and any other fun little tips and tricks you use on the trails that might be helpful for other hikers to know. (We’re currently looking for anyone who would like to speak/present at the event, sign up below. We highly encourage you to participate. Talks can run anywhere from 2 to 10 mins. Really it’s up to you. We’d love to hear what you have to share. We’ll get together at Holy Grounds Coffee & Tea, in El Sereno (East Los Angeles), at 7:00pm to 8:30pm. Please arrive 1/2 hour before to get your drinks and we’ll get started at about 7pm. They’ve been generous enough to save us a section of their outdoor patio for our event and in return it would be great if you support their small business by purchasing a drink or food item. All members/fans of LA Trail Hikers, first-time hikers, and those simply interested in hiking are welcome to join in on this event. We hope to see you there! We’re looking forward to some cooler Fall hiking weather. Please check the following page for full event details. The designated place we will visit for our hike has not yet been decided, but that shouldn’t stop you from making your travel plans. Once we decide, we’ll let you all know in a different post. All participants will be in charge of themselves and their own expenses, which includes things such as booking their own accommodations and setting up their own travel plans (we highly recommend carpooling and room sharing). LATH will not provide anything but a hike details page with a meeting place that will be close to the Las Vegas strip area. WHERE SHOULD I BOOK MY ROOM? Most hikers will book rooms around the main Las Vegas area, as we can always drive to the meeting point. We suggest you get your room closer to the area you’ll be after the hike, especially if you want to hang out on the Las Vegas strip (Las Vegas Blvd) area or Downtown Vegas (Fremont). If you are going to Las Vegas for the first time, or simply like to go all out, it’s very likely you’ll want to stay along the strip. If not (and you’d like to save some money), you’ll likely want to stay at a hotels that are South or North (and off) the strip for a better rate. Whatever service you choose to book your room (e.g. expedia.com, hotels.com, vegas.com, cheaptickets.com), consider using retailmenot.com for discounts/promo codes to apply to your booking. HOW MANY DAYS WILL THIS EVENT BE? The event will be solely on Saturday (morning to afternoon). However, you choose when you arrive to the Las Vegas and when to leave. Most people will get to Vegas on Friday evening and leave on Sunday morning/afternoon. WHAT WILL THE HIKE(S) BE LIKE? We’ll be working on setting up a few hikes that will vary from levels. However, we’ll try to give more more specifics once everything is detailed out on our end. WHAT WILL I EXPECT FROM THIS ROAD TRIP? Once you have requested time off from work (if needed), booked your hotel, and made travel arrangements, you’ll be good to go. We’ll be providing more information in future posts as we put all details together. But for now, anticipate a great road trip with an awesome group of hikers! 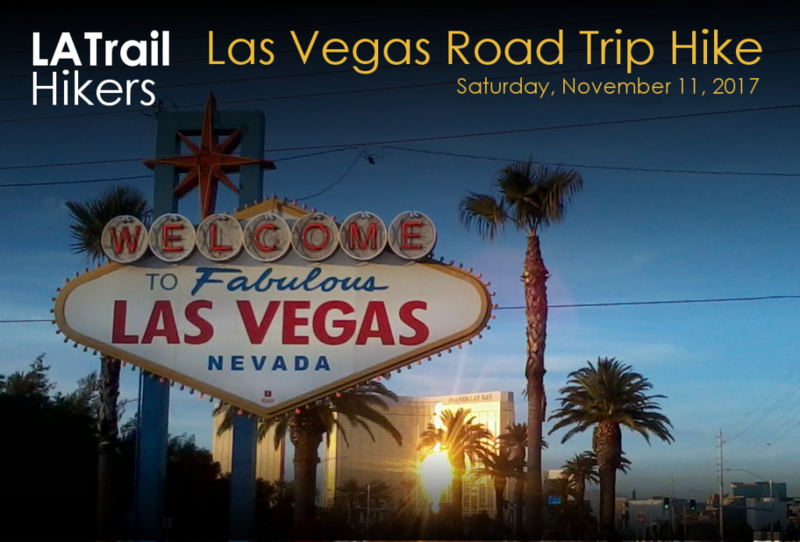 Stay tuned as we provide more details for our upcoming 2017 LATH Las Vegas Road Trip Hike! 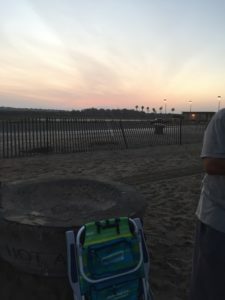 We will be at the fire pit directly between Life Guard Towers 24 & 25, in front of the restrooms areas (if you pass tower 25, you’ve gone too far). 3 pits north/left of tower 24. You can park in Parking Lot #22 (which you will see as you pass the lots). As you enter Bolsa Chica State Beach, make sure you remain on the right lane so you get to enter into the right side parking. Once inside, you’ll drive past a few of the lifeguard towers and look for tower 24 and 25. Hey LA Trail Hikers, it’s time to enjoy a day in the sun at our annual LATH Beach Party on Sunday, August 27, 2017! We’ll be taking a day off trails to celebrate the accomplishments of our LATH hikers with an all day beach party! 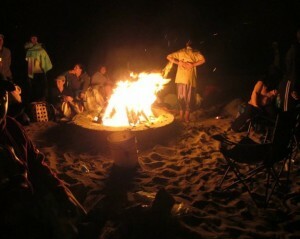 This event starts early in the morning for some good swimming/sunbathing, and continues through the night for a great evening with a bonfire. Some hikers spend all day with us, and others come for part of the day or night. And best of all, it’s a potluck style event, so bring any good food and non-alcoholic beverages to share with everyone! Stay to your right as you enter the beach lot entrance. LIFE GUARD TOWER #: Between Lifeguard Towers 24 & 25. You can park in lot #22. 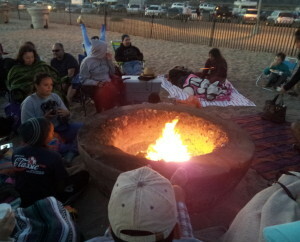 The entrance to the beach is on Pacific Coast Highway, about one and a half miles south of Warner Avenue. 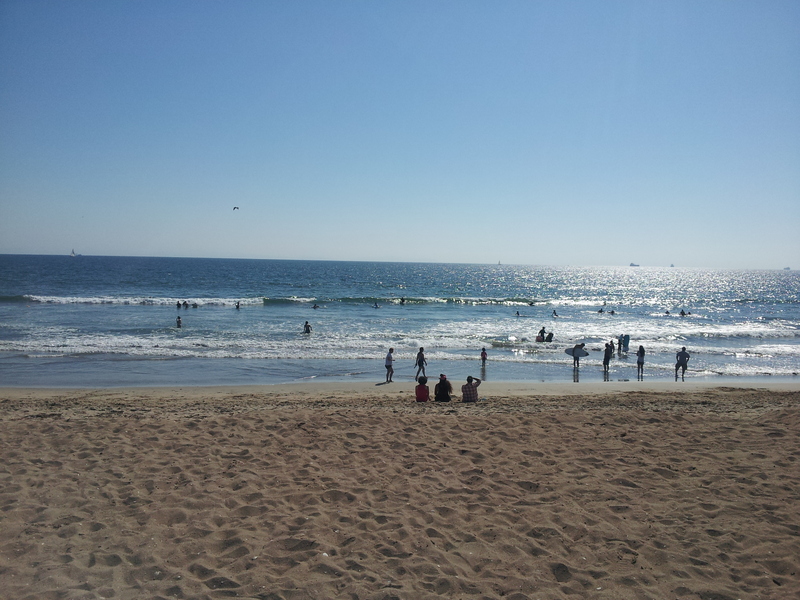 Bolsa Chica State Beach is slightly south of Seal Beach and north of Huntington Beach. 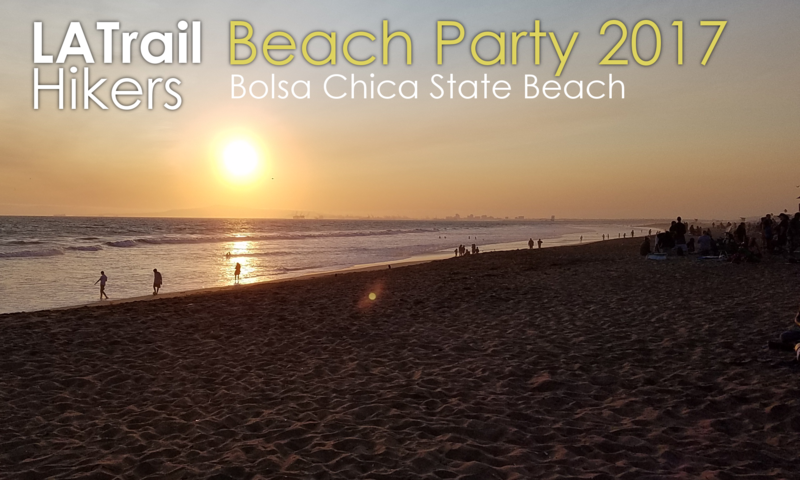 EVENT DESCRIPTION: The sun is out and the LA Trail Hiker are ready for their 2017 Beach Party! 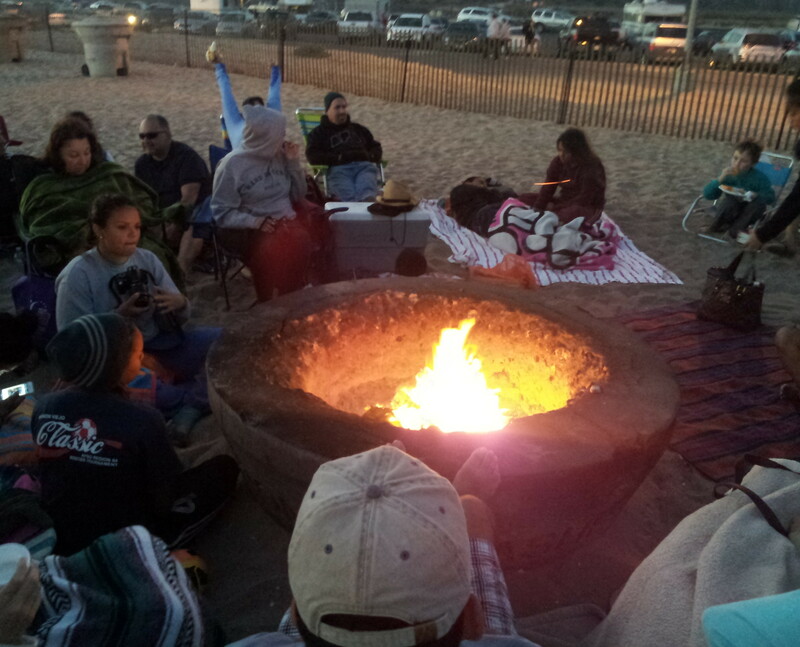 Join us to enjoy the wonderful combination of great food, friends and families at Bolsa Chica State Beach! This event is open to all our LATH Hikers. Sunscreen – You’ll be glad we reminded you. Water – Keep in mind you’ll probably get thirsty throught your stay and will need to keep hydrated. Beach Blankets – When you want soak some sun, take an after-swim nap, or take a break from sitting/standing. Towels/Swimwear – Think ahead and prepare for some fun in the water. Coolers/Insulated Lunch Boxes – If you plan on bringing some food/refreshments that need to stay cold, you might consider bringing one. Beach/River/Water Sandals – You may want to get into the water but with foot protection, so these may come in handy. Sports Equipment – Bicycle, Football, Hula Hoops, Volleyball & net, and any other type of fun sports equipment you might want to share. 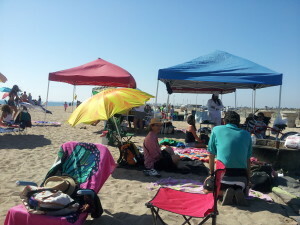 Beach Umbrellas – Keeps you under the shade. Plastic Bags – Keep your wet clothes separate. Throws/Blankets – Later in the evening you may want to cozy up with a blanket as it will get cold at night. Sweaters/Long Pants – Again, it does get colder later in the evening. Keep yourself warm. Firewood – Have any extra wood laying around? Bring some for our fire pit. BBQ/Cooking Utensils – Do you have portable cookware? We’ll need some where to cook those burgers. 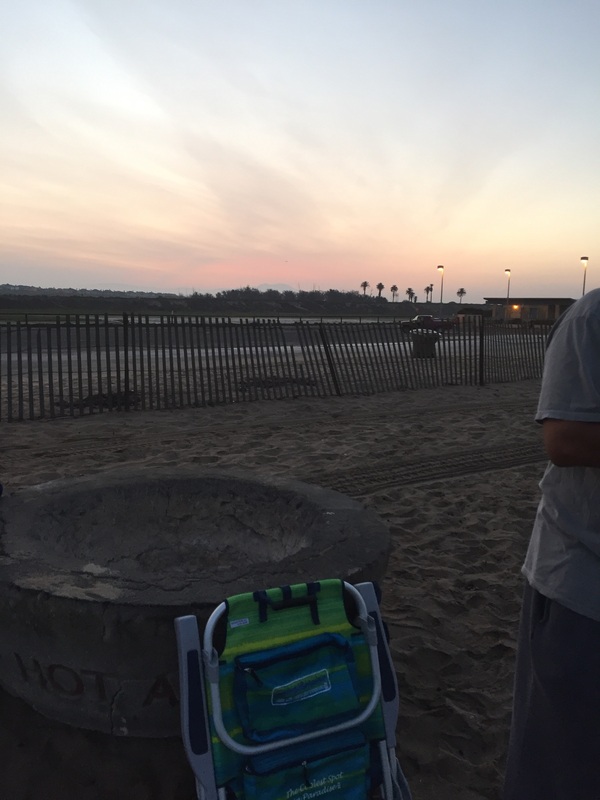 Propane Only BBQs – Only propane BBQ’s are allowed at Bolsa Chica State Beach. No enclosed tents. (However, EZ-UP/Canopies (half tents) and open tarps are okay). Other Recommendations? – Post them on our FB Event page. 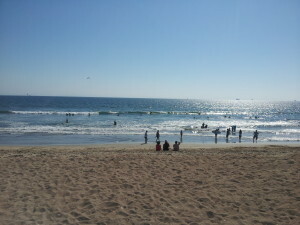 BEACH PARKING & FEE: $15.00 per vehicle (9 persons or less per vehicle). $30.00 for over-sized vehicles. It is best to arrive prior to 10 am to get good parking. It gets very crowded this time of year, so if you don’t want to spend hours waiting in line and trying to find parking, it is advised that you come early or later in the evening, not midday. If you come after, you may get locked out out of a full parking lot. And they will only allow people in once a number of people have left. So please get there earlier in the day. DOG FRIENDLY? : Not really. No Dogs allowed on sand, they can be on a leash on paved multi-use trail (bike path) only. We recommend leaving your pets at home, or with a designated caretaker while you’re at this event. 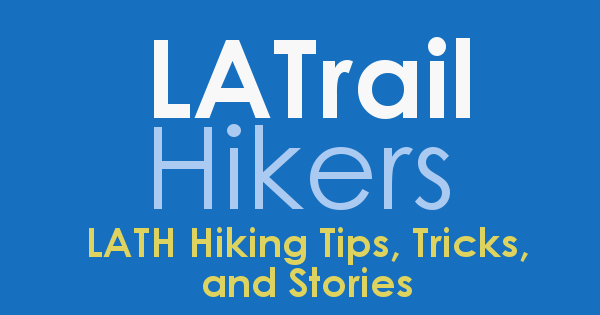 DISCLAIMER: LA Trail Hikers and its Leads/Organizers/Participants do not take responsibility for any harm,bodily injury, accidents, or damage to personal property. 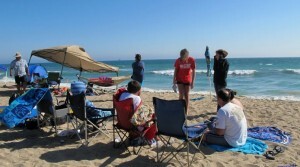 By attending the event, you confirming that you understand that all outdoor activity such as bicycling, swimming, and all other beach activity may have an associated danger, and will not hold any hike lead/organizer, participant, LA Trail Hikers, or any group associated pet responsible for any hazard to your well being. We are not responsible for any loss or personal injury. Join us this coming Thursday, August 17, 2017, in celebrating our 8th year anniversary! Our group officially started on August 17, 2009 and has been active ever since. And to mark this joyous occasion, we’ll be having an evening of fun with our group with an awesome Potluck! No hiking involved, just an evening to socialize with each other and share some memorable hiking stories. It is not mandatory to bring an item to attend. We’re sure there will be plenty of food to go around. We’ll see you there! 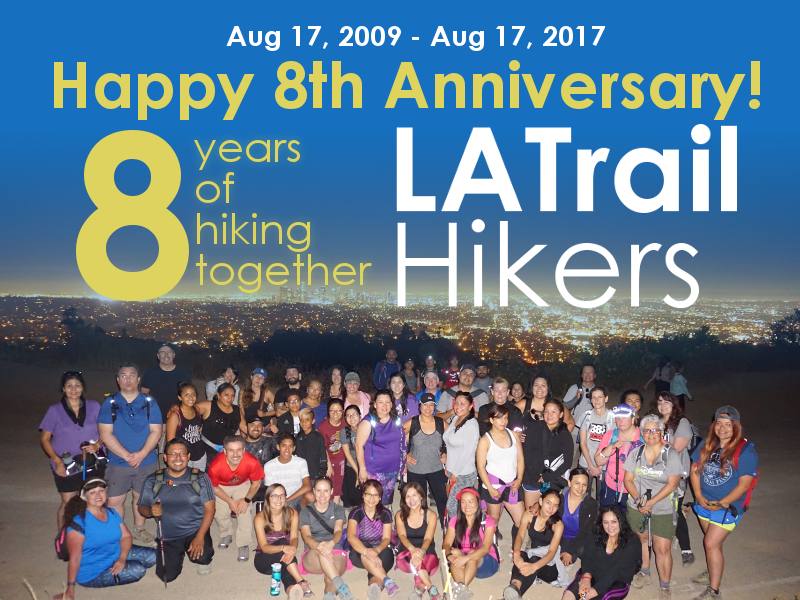 EVENT: The LA Trail Hikers (LATH) Celebrates its 8th year anniversary! POTLUCK: You are welcome to bring any food, soft drinks, and desserts that you would like to share with the group. Homemade food and goodies are always tasty too! Also, some people may consider bringing utensils, napkins, cups, and other non-food items as well. POTLUCK LIST: Check out our FB event for a list of items people may be bringing. NOTE: We will gather by the purple fire hydrant, which in the parking lot next to the path that takes you down to the Merry Go Round. Then we’ll find a table or two nearby. TAKING 5 FWY NORTH FROM L.A.: Take the Griffith Park exit (this is right after the Los Feliz exit). At the exit, make a right on Cyrstal Springs. Continue until you see the next available left turn (you’ll see a sign that says Merry Go Round). Go up and you’ll reach what looks like a dead end but if you turn right, you’ll see the big parking lot. TAKING 5 FWY SOUTH FROM BURBANK: Take the Los Feliz exit (which is after the Colorado exit). At the exit, stay on your left and make a left onto Los Feliz West. Next, take the first available right into the Park (this will be Crystal Springs Blvd). Continue past the first few stops until you see the next available left turn (you’ll see a sign that says Merry Go Round). Go up and you’ll reach what looks like a dead end but if you turn right, you’ll see the big parking lot. South on Alameda Blvd > Right on Victory Blvd > Go over 134 fwy > Make a left on on Zoo Dr > Continue past the Zoo, the Autry Museum (you’ll be making a zig zag after this), Golf Course (on left-hand side), Pass the first right turn > make a right at the second second stop sign > make a right into Parking Lot #1. DISCLAIMER: LA Trail Hikers and its Leads/Organizers/Participants do not take responsibility for any harm, bodily injury, accidents, or damage to personal property. By clicking “Attending,” or attending the event, you confirming that you will not hold any hike lead/organizer, participant, LA Trail Hikers, or any group associated pet responsible for any hazard to your well being. You are fully responsible for yourself. It’ll be hot, but our fun won’t stop. We’ll keep hydrated and apply our sunblock. Happy 8th LATH! 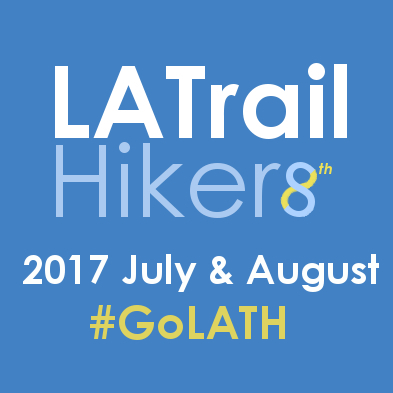 2017 LATH @ Walk L.A. Parking: Parking is limited so we encourage participants to carpool whenever possible. There will be a designated participant drop off area close to the site for those taking Lyft/Uber or if you want to drop off friends and family before parking your car. Look for parking signs as you approach the event location. WE SUGGEST GETTING THERE EARLIER THAN 8 AM IF YOU WISH TO PARK THERE. 8:00 a.m. – 8:30 a.m. – LA Trail Hikers meet next to the Bike Rental area. The Route: Walkers will complete a 4-kilometer (a 2.5 mile) loop around the golf course in the Crystal Springs Picnic Area. It should take 45 to 60 minutes to complete. Be sure to wear comfortable, sturdy shoes and sunscreen. The route is handicap accessible. Attendance: Due to venue capacity restrictions, only those registered as adults or children will be able to attend the event. Food/Refreshments: Fruit and water will be provided for all walkers. Additionally, food will be available for purchase from food trucks that will be on-site. There is a picnic area available so participants can bring their own picnic if they’d like. Walk L.A. T-Shirt Pick-Ups: Event T-Shirts will be available to all participants on site the day of the event. Additionally, we are planning to distribute T-Shirts at Children’s Hospital Los Angeles on Wednesday, June 14, from noon to 2 p.m. Look for us in the terrace outside the HBO Café. Pets are not allowed. Due to event insurance coverage, we are not permitting walkers to bring their pets to this event. This is fairly typical for events of this nature, especially with very small children who may attend. Fundraising does not stop on June 17! Your Walk L.A. page will stay active and able to accept donations until July 31, 2017. 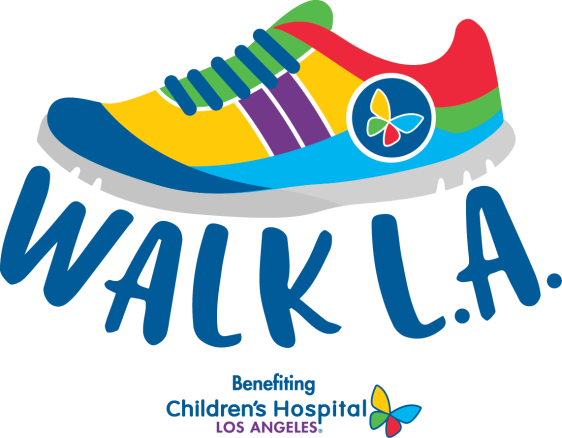 Click here to learn about Walk L.A.’s fundraising prizes! For further information please review the event’s FAQ page. If you can’t find your answers there, please feel free to contact [email protected] or via phone number at (323) 361-1965. Make sure to plan for time to enjoy the Wellness Family Festival, which will include games for all ages, wellness tips from CHLA departments, music, etc.